You will note from the side bar, gentle reader, that Socktober Socks #1 should have been finished last night at midnight. Am I finished with them? Yeah… I’m finished with them all right. The picture shows their fate. From the pool of curly yarn, you can probably guess how far I got with them. I just could not feel the love from this yarn. 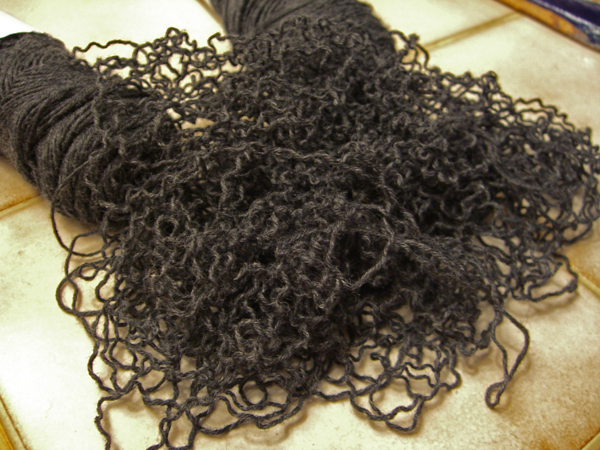 So soft and lovely in the skein, the fabric I knit from it felt… scratchy. There’s no other word for it. Maybe smaller needles and a denser fabric might have helped. Maybe I could have washed the darn things in some Downy. But I just couldn’t keep going with them. I do not want feet I care about to be encased in something harsh and uncomfortable. In fact, I found myself doing all kinds of things to avoid knitting those socks. For example, I modified the map page showing #1 Son’s tour dates so that the cities are numbered with lines drawn between them, and little pop-up windows give info about the venue (where I knew it) and there’s a line drawn between cities so you can follow along with where they’re going next, and the markers are numbered and color-coded for past, present and future. I really didn’t want to knit those socks. Eventually I gave in and sent them to the frog pond. I was not going to be happy with them, ever. The yarn will go into the stash to become… something else. I started in on Socktober Socks #2 in Regia Silk in colorway 189. I heard this yarn whispering Judy… knit me into Jaywalkers… that is what I am made for. So I started a pair of toe-up Jaywalkers. 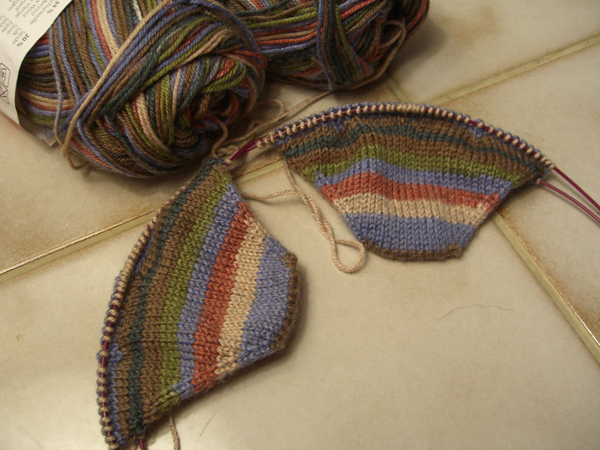 I think I must be the only person in the knitting blogosphere who hasn’t hopped on to the Jaywalker train. But who am I to argue with my yarn? I now hope to complete Socktober Socks #2 on time, if work does not continue to compete. I have a different skein of yarn — some STR in a colorway called Downpour — tagged for the second attempt at Socktober Socks #1. I was left with a warm heart. Oh, and… Happy Birthday Alice! And Happy Birthday to B, also. I know it was last week and I’m sorry I missed it!